A genuinely hygienic, heavy-duty, folding large container has arrived. The new, Dolav DFLC is made with easy-to-clean base and sides as five removable parts. Each is a one-piece, single-skin polypropylene moulding with integrally moulded hinging and interlocking edges. There is nowhere for dirt or contamination to hide and with its FDA approval for direct contact with food, the DFLC meets the hygiene demands of food manufacturers. The 2:1 folding ratio can reduce the cost of storage and return journeys. Sides and base can be solid or perforated for good airflow around food products in a temperature range from -20°C to +40°C. It is really easy for one person to open up or fold down the Dolav DFLC. It is just as easy to remove or attach sides for thorough cleaning or replacing parts. The Dolav folding large container (FLC) offers a heavy-duty, hygienic, returnable transit packaging (RTP) solution which holds 750kg in a volume of 600 litres. 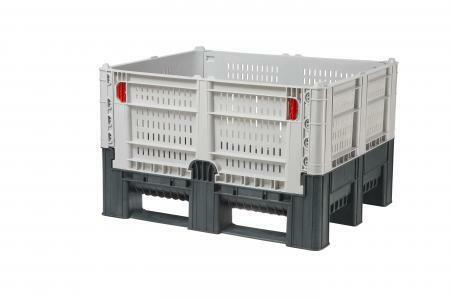 Its folding walls, when upright, provide maximum protection for its contents and load stability. Anti-slip corners assist safe stacking. Its footprint of 1200x1000 mm and height of 740mm (or 370mm folded) ensures it inter-stacks, upright or folded, with the Dolav Ace and Classic plastic pallet boxes. For safe tipping the base of this folding large container has three integrated runners and is moulded to securely hold the sides in place when upside down. This Dolav patented interlocking system prevents buckling under heavy load and allows a max stack load of 3750 kg. Importantly for returnable packaging, the Dolav DFLC can optionally have a company’s logo embossed or customers can have their logo hot stamped and also choose sequential numbering. It is available from the Dolav UK’s warehouse.